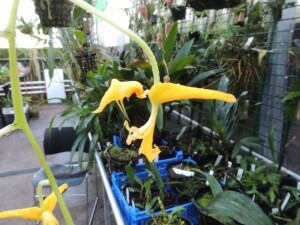 This Gongora produces long spikes of large flowers and is native to Colombia. This clone is missing most of the red spots usual in the species. We grow our Gongoras in baskets but make sure that they stay damp and only hang tem up high when their pendulous flower spikes appear.